In April 2007, the US military released the first-ever documents detailing individual claims for civilian casualties in Iraq and Afghanistan. While the US military attempts to minimize civilian casualties, loss of innocent life is a reality in conflict. 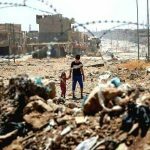 Knowing civilians suffer death, injury and property loss during armed conflicts – whether in combat or merely by the presence of military forces – the question arises: What should, or must, the US military do to address the damage caused by military operations to civilians? Center for Civilians in Conflict (CIVIC)’s mission is to improve protection for civilians caught in conflicts around the world. We call on and advise international organizations, governments, militaries, and armed non-state actors to adopt and implement policies to prevent civilian harm. When civilians are harmed we advocate for the provision of amends and post-harm assistance. We bring the voices of civilians themselves to those making decisions affecting their lives. For more information, contact Christopher Allbritton at +1 (917) 310-4785 or chris@civiliansinconflict.org.